Cancer Prevention, Screening and Early Detection are rather neglected actions in most of the Mediterranean bordering countries, with sensitive burden on health costs and suffering incurred for the cure of advanced stage disease. Due to the aging of population and the changes in environment and lifestyles, cancer incidence and mortality are becoming a global health emergency. They will soon become a priority for national Health Authorities, also in view of decreasing economic resources. World Health Organization’s data clearly show how survival of cancer patients, because of late diagnosis, is directly proportional to the amounts of resources allocated to prevention and early diagnosis. 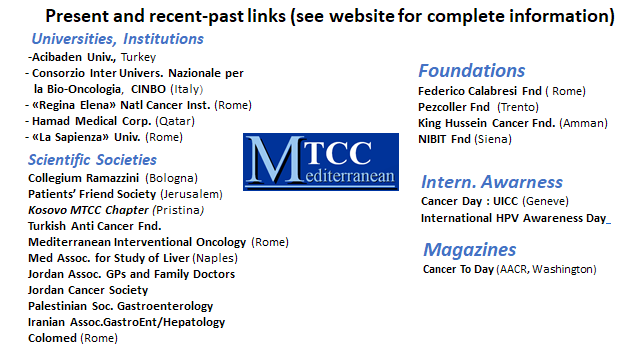 A Mediterranean Task Force for Cancer Control (MTCC) was established in 2004 as a Non Profit non Governamental Organization (NGO), open to representatives of the Mediterranean bordering countries as well as other countries. Representatives from Albania, Algeria, Bosnia-Herzegovina, Bulgaria, Croatia, Egypt, France, Greece, Iran, Italy, Jordan, Kosovo, Lebanon, Libya, Macedonia, Montenegro, Morocco, Palestine, Portugal, Slovenia, Spain, Syria, Tunisia, Turkey. IARC and UICC expressed their support to the initiative. The MTCC, managed by responsible and reputed professionals, aims to influence at the national level the appropriate institutions and bodies (lawmakers, stakeholders, health officials, voluntary organizations, etc.) to prioritize health policies which enforce prevention and early diagnosis, in contrasting the foreseen increasing cancer burden. In this context, Prevention and Early Diagnosis are recommended as priority strategies in view of the diminishing economic resources and the skyrocketing prices of treating advanced disease. The latters will undoubtedly produce a broader unequal access to treatments resulting from differences in individual income. Although cancer research has progressed at rapid pace, a gap remains between what is known about how to improve cancer prevention and early diagnosis and what is implemented as best practices in given health system and communities (Cancer Epidemiol Biomark. Prev. 23(11); 2512–21. 2014 ). This is medically Unjustified and Unethical under whatsoever point of view and for any health provider , since the large proportion of the most commonly occurring tumors can be efficiently prevented and diagnosed at early curable stages. influence policies and promote programs and activities to eliminate disparities in cancer control in relation to gender, race ethnicity, insurance & socio-economic status, and place of residence. Training: Full immersion Teaching Courses. MTCC advocates that Cancer is not only a medical issue but requires the involvement of the largest number of stakeholders, including non-doctor health officers, administrators, schools, patients’ advocacy groups , survivors ( see Past Activities).